For those of you who don’t know the Sundance Film Festival has been held every year in Park City, Utah since 1985. Started by Robert Redford, it is now the premiere film festival in the United States and second in the world next Cannes Film Festival in France. I usually don’t have the money or time to attend a full two weeks of films but I see one or two and read about the rest. Unfortunately it seems that by the time the films I wanted to see from last January are finally released the next festival is about to begin (Independent films generally premiere at festivals and are then picked up by a distribution company who spends the next 6-12 months working to polish and release the film to a wider audience). 2014 at Sundance saw the premiere of Boyhood, Calvary, Whiplash, The Raid 2, The Skeleton Twins, A Most Wanted Man, and one of my favorites, Locke. I’ve made it through about half of these so far and am trying to finish the rest before 2015 starts and my list grows once more. 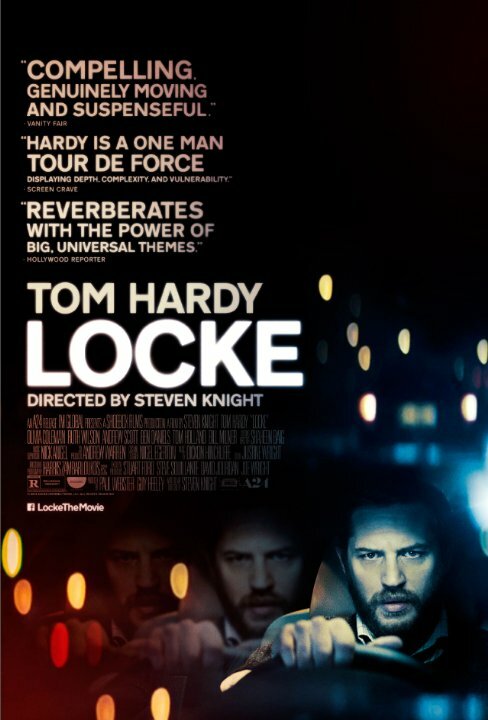 Locke stars Tom Hardy, as the only man on camera for the entire film. In fact the entire film takes place in one location: a car, at night. What does Tom Hardy do in this car? He talks. Not to himself but to other people through his cars built-in-hands-free-phone. He’s on a mission. But what is his mission? Where does he have to go so urgently? What has happened that is more important than his job, his wife, and his family? These are the questions that may run through your mind while watching Locke, and while it may seem like a cruel joke, the film is actually a testament to the minimalism of film making and acting. The film is taut and gripping, never boring. Hardy raptly holds our attention and delivers a performance very few others could. To say any more about the film would be to spoil it, but suffice it to say the film is a deeply human portrayal of mistakes, regret, and what it takes to set things straight. Locke is the type of movie that expands and elevates your idea of what filmmaking can and should accomplish. After seeing movies like Locke you’ll wonder how anyone can justify a $200 million dollar budget on movies that have absolutely nothing to say.